"I don't know, what do you want to do?" If your date night planning includes this sentence, you might need to up your game. We're talking about date night this month, and I'm encouraging every couple to take a fresh look in 2016 at their date night habits. Regardless of how you did last year, I'm asking you to up your dating game and take it to the next level in the new year. 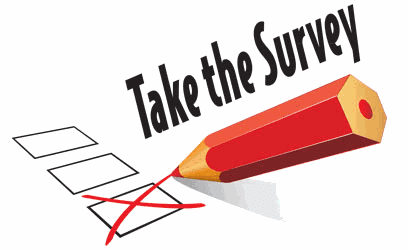 So far, in my current poll, What Do You Want More of In Your Marriage?, I'm finding lots of couples looking for more emotional connection (34%), fun and adventure (30%), romance (19%), and more time together (18%). The good news is that all of these can and should be fueled by having more regular dates. Wife: "What should we do for date night this week?" Husband: "I don't know, what do you want to do?" Wife: "Whatever you want to do." Husband. "No, whatever you want to do." Both shrug. And round it goes, with no one wanting to make the decision. I do most or all of the planning - This was the most common answer. 54% of husbands and 41% of wives said this was the case. We plan dates together - About one in five couples plan their dates together. We take turns planning - one in four wives and one in ten husbands said they usually took turns planning their dates. Regardless of who planned them, people were not all that happy with their date night activities. The average "content happiness score" was only 2.2, and basically the same for men and women (scale was 1 to 5, with 5 being most happy). You would expect that the one planning dates would be the happiest with the content, but that wasn't the case. 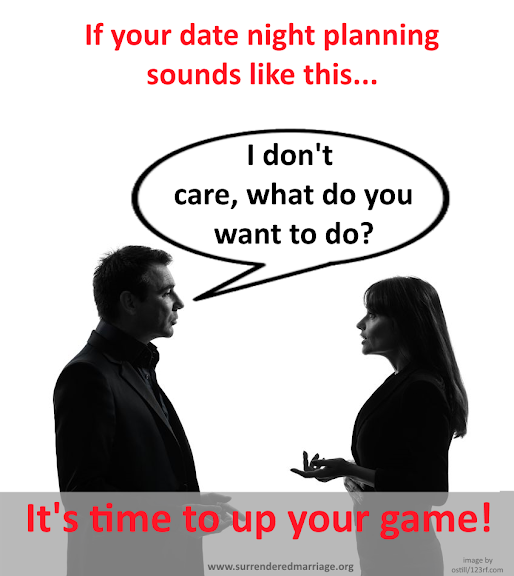 In fact, happiness with the content of date night was about the same for all but one kind of planning: taking turns. Taking turns planning date resulted in a higher reported degree of happiness, especially for wives, but to some extent also for husbands. Takeaway: take turns planning what you will do on your next few dates. There are several reasons I like this approach. First, it allows each to take the initiative in turn, which is an act of pursuit. Second, there tends to be fewer "default dates," where you decide to just do the same old thing because it's easier, or because no one wants to decide. Third, taking turns creates an opportunity to surprise your spouse with something special, interesting or even adventurous once in a while. Fourth, it's an opportunity to bless your spouse with something that you know would interest him or her, even if it isn't your cup of tea. Finally, taking turns works - and I have the data to prove it. Dinner out seems to be the go-to date night option for most, with 94% dining out often or sometimes. About half took to outdoor activities (49%), with coffee/desert coming in third at 42%. Movies (42%), shows & concerts (31%) and sporting activities (28%) were next, with drinks/cocktails coming in last at 19%. I asked couples what kind of dates they wish they had more of. Here is what they said. To my surprise, the top two were the same between what people did and what they wanted to do more: outdoor activities (54%) and dinner (51%). In fact the only significant difference between the two charts above was that my survey takers wanted to to more cultural events like shows, concerts or other performing arts than what they were currently doing. Despite not being all that happy with their current date night activities, I got the impression that people were just asking for more of the same. Takeaway: splurge once in a while on tickets to a special event. It takes more planning a little more money, but it might be just what you need to give your date night routine a shot in the arm. Second Takeaway: If you aren't that happy with your date nights, change them! My wife and I are fairly protective of our date nights, and I would say most weeks we manage to have a date of some kind. It's easier for us to be consistent now that we are empty-nesters and have more control over our time. But I've been convicted by writing this series that I need to take my own challenge and step up our date nights as well. For her part, Jenni can't remember the last time she planned an outing for us. We haven't been particularly innovative or done much planning ahead, so we have tended to default to many of the same activities, which often means dinner out and the occasional movie. We love spending time together no matter what we do, and neither of us puts pressure on the other to create a "wow" experience every week, but we can definitely do better at making our dates more special. We've decided to take a crack at taking turns planning our next few dates. We also do a lot of date nights in. Sometimes we are just too tired and harried to go out, and a quiet night at home sounds like just the ticket. 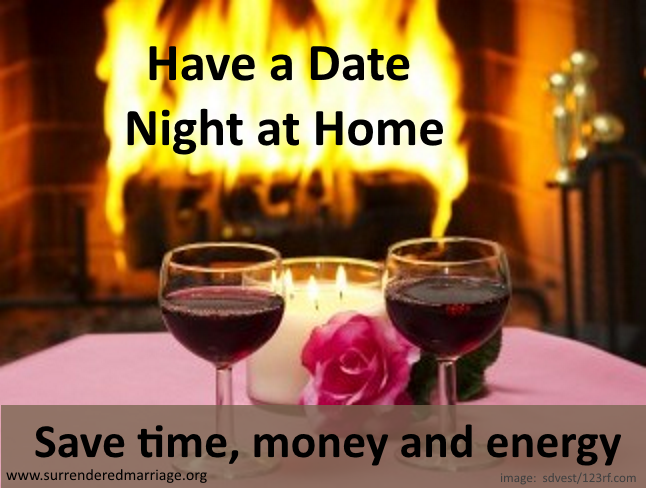 My survey also covered date nights at home, and around 30% said half or more of their date nights were spent at home. We'll dig into date nights at home in my next post. Be sure to stick around - sign up for posts by email if you want to get the rest of this series delivered right to your inbox! So what does your date night look like? What do you wish you could do more? Who plans your date nights? How's it all working. Tell us your story. Leave a comment. 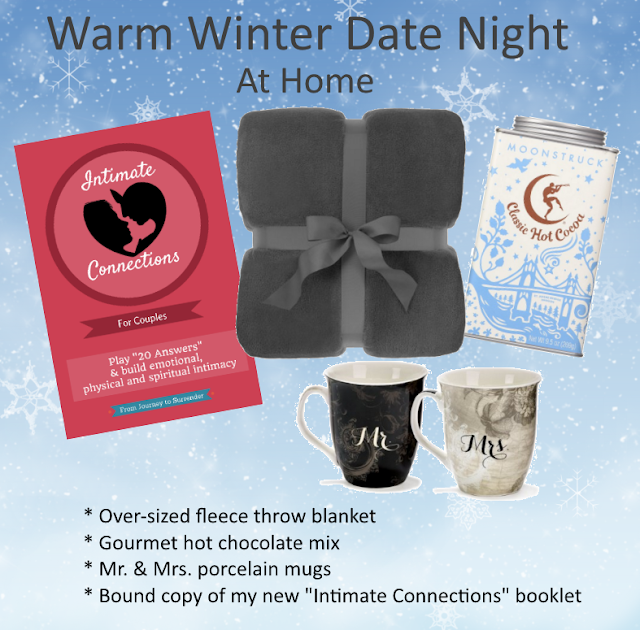 A warm welcome to all the new subscribers who signed up through my "Warm Winter Date Night" giveaway. Congratulations to Krista on winning the contest - I'll be contacting you shortly. To the rest of you, I hope you'll stick around. I hope you'll be a regular reader (and commenter) here on Journey to Surrender. 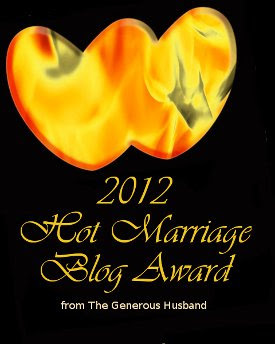 Most of all, I hope your marriage will be blessed and strengthened by what I share. As I mentioned in my last post about the giveaway, I'm launching into a new series this month: Date Night. I'm sure you've seen lists like this before. You've read them, and thought "yeah, we really need to do that." Then you went on with your Iife and forgot all about it. I get it. Life crashes in, and thoughts of date night fade into the distance. It's too hard to do it with any consistency, and there are too many reasons it just doesn't seem possible right now. Maybe someday. Maybe someday when the kids are older. Maybe someday when work isn't so demanding. Maybe someday when I'm not so tired. Maybe someday when we have more money. The problem with waiting for "someday" is that someday never comes. There will always be reasons that continuing to date each other is difficult, no matter the season of life you find yourself in. 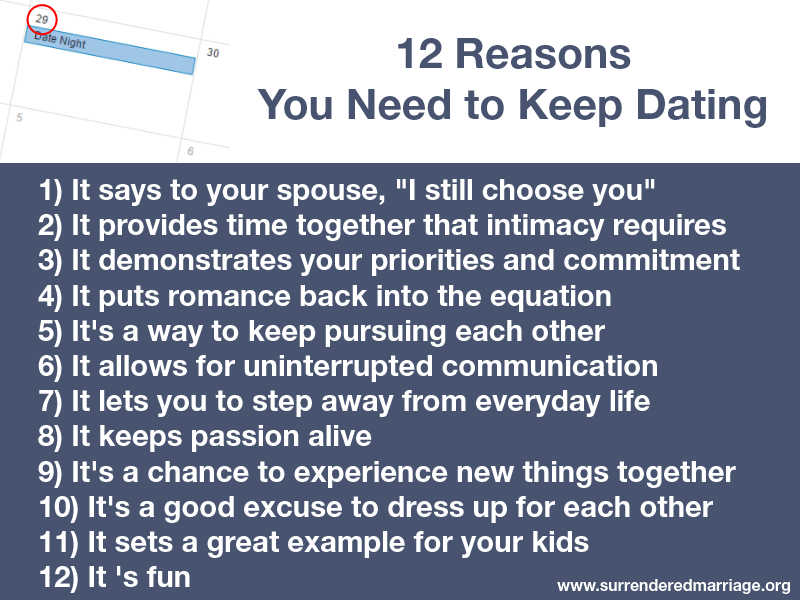 Whether you've been married 4 months or 40 years, you need to keep dating for all the reasons listed in the infographic above and more. You probably already know that. The question is what are you going to do about it? Now? I'm not a big believer in New Years resolutions. I am, however, a big believer in making a plan to accomplish a goal, especially when that goal has to do with your marriage. I'm going to be sharing some results from my recent Date Night poll in the coming posts, along with Date Night ideas, and additional encouragement as to why this is so important. I'll share here the first few Date Night poll results (more to come in future posts). In my survey, 47% of respondents were either somewhat or very unhappy about the frequency of their dates. Only 10% were very happy. 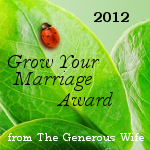 Clearly there is a lot of room for improvement in most marriages - probably in yours too. You are not alone! Here's what people said were the biggest impediments to having more regular date nights. Busyness was clearly the number one enemy of date nights, followed closely by having not enough money or enough energy to make it happen. A significant majority reported one of these as among their top obstacles. It's easy to say, and less easy to do, but these really come down to managing your priorities. Bottom line: these marriages are getting leftovers, and most of the time there aren't any. 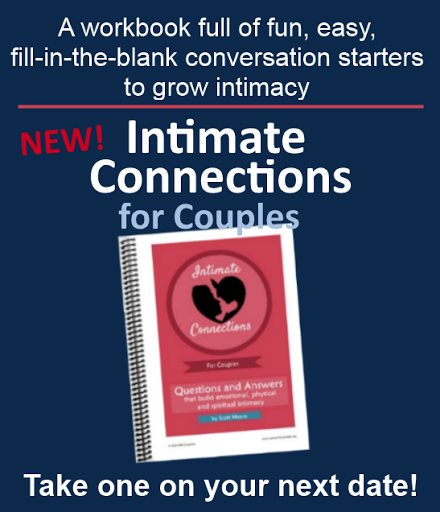 So as you set plans and goals in place for 2016, sit down with your spouse and talk about what is keeping you from more frequent and regular date nights. Identify your top few obstacles, and then brainstorm options for overcoming them. What are you willing to say "no" to, in order that you can say "yes" to a better, more intimate, more passionate marriage? Make specific plans for who is going to do what differently in order to make a way for dates to happen more consistently. Let's start with baby steps, and just look at what's left of this month. Get out your January calendars, and set aside at least 2 or 3 dates in the coming weeks for dates. You don't have decide right now what you are going to do (that's for my next post), but decide who will be in charge of making the plans, whether you take turns, plan together, or one person does it all. Whoever it is that is designated as the date planner, hold each other accountable. It's okay to ask, a week or so out, whether the plans are all set. Don't be tempted to say, "Well, if he/she really cared, I wouldn't have to remind him/her." Give each other the benefit of the doubt. Better to say, "I'm really looking forward to our date on Friday. Can you clue me in on your plans? Or is it going to be a surprise?" What is the biggest obstacle for you and your spouse when it comes to having more dates? What do you think can be done to overcome it? Leave a comment. Next Time: "I Don't Know, What Do You Want to Do?"